Calais migrants pepper sprayed by Police. New video shows an unprovoked attack by security forces. Yesterday night a man from Eritrea was abused by a group of racists. They took him some 20 km from where he was abducted close to the train station in Calais, then beat him hard with fists, feet and with an iron stick. He has several broken rips and his face is hardly recognizable. He got pepper-sprayed and all his money and his mobile were stolen. To get rid of him they threw his body into a pond. We must not let them get away with this! Ces images ont été capturées le 5 mai 2015, dès 8h du matin et tout au long de la journée, sur la branche d’autoroute menant au port ferry de Calais (A216). Ce sont juste quelques exemples du quotidien : l’ordinaire de la brutalité policière à l’encontre des candidats au passage entre Calais et l’Angleterre, qui tentent de se dissimuler dans les camions. Calais Migrants Solidarity entend aussi rappeler les conditions difficiles dans lesquelles ce travail peut être réalisé. Rappelons qu’en janvier dernier, l’ONG Human Rights Watch avait publié un rapport dénonçant les violences policières, entraînant une réaction condescendante, dénégatrice du ministère de l’Intérieur (“le Gouvernement déploie des réponses globales et adaptées.”). These images were captured on the 5th of May 2015, beginning at 8 am and continuing throughout the day on the motorway branch leading to the ferry port of Calais (A216). These are just some examples of the everyday police brutality against people who attempt to cross the channel from Calais to the UK by hiding inside trucks. Calais Migrant Solidarity also intends to recall the difficult conditions faced when documenting police violence. 1 – at 0’12, Three members of the French riot police (CRS) force a person who was hidden in a truck to the other side of the motorway guardrail. At the end of the sequence (0’22) a second police officer discharges a burst of tear gas while the two persons were fleeing. 2 – at 0’28 “,A CRS officer removes a person from a truck and pushes him violently over the guardrail. 4 – at 0’51 “, One person is violently thrown over the guardrail by the police. After that a CRS officer assaults another person, kicking him to the ground. The person assaulted gets up and tries to run away but then receives kicks and punches and is pushed violently over the guardrail. At 1’09 (left of the image) a CRS officer uses pepper spray against people who are walking away. 5 – at 1’15 “, A CRS officer removes a person from a truck and violently pushes him over the guardrail. 6 -at 1’24 “, A CRS officer threatens a group of people by running towards them with a baton screaming, as it if he was playing with them. police violence, they stop him, floor him and push his head into the ground with a knee. 8 – at 1’55 “: A CRS officer hits the guardrail with his baton, threatening a group of people. Recall that in January the NGO Human Rights Watch published a report denouncing police violence, resulting in a condescending reaction dénégatrice the Ministry of the Interior (“the Government deployscomprehensive and appropriate responses.”). 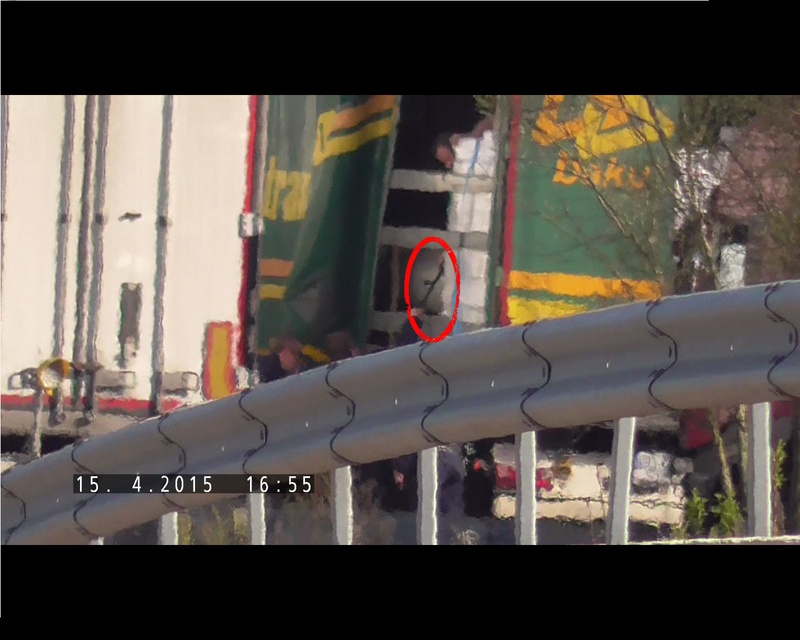 On Wednesday the 15th of April 2015 one of our cop watch teams captured this footage of two CRS riot police handing a truck driver their batons, with the intention of assisting him in the illegal assault of refugees found in the back of his lorry. We have heard many stories from migrants about how the police beat them in the back of trucks where you are ‘at their mercy’ and there are no witnesses. This sadistic tactic is used to deter refugees travelling to Britain. The footage was captured near the entrance of the Euro-Tunnel and shows French police breaking French law by handing a lorry driver their weapons and watching as he uses them to assault or intimidate unarmed and vulnerable people inside his vehicle. You see the police handing their batons to the driver at 1 minute 16 seconds and 1 minute 50 seconds in the video. 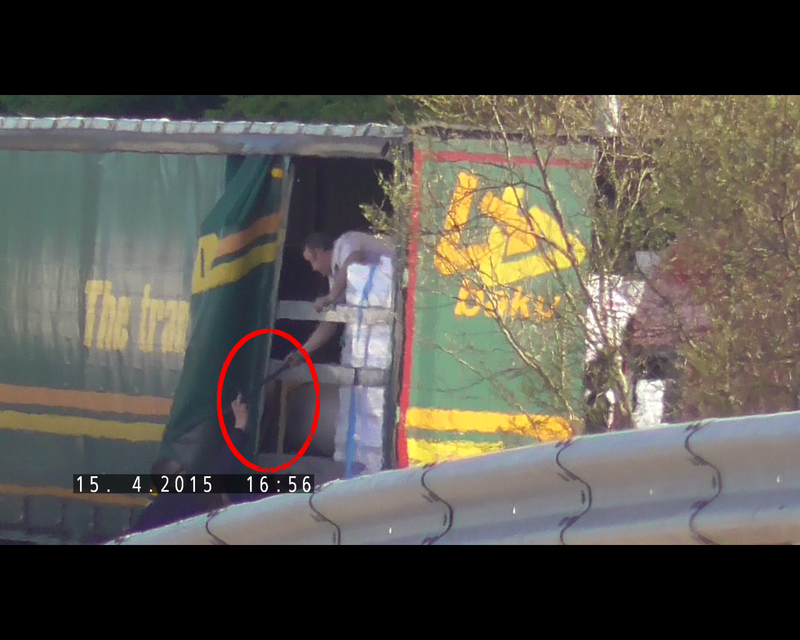 At 2 minutes 53 seconds you see a migrant coming out of the truck. From 4 minutes 10 seconds you can see the CRS van registration AL 178 JH, despite distortion created by the heat of the day. We apologize for filming this crime at long range and not intervening but have learned from bitter experience that making ourselves known to the police results in cop watch teams being assaulted, arrested and having their cameras destroyed, leaving the violence to continue undocumented. This video clearly shows the French state breaking its own laws in order to assist the British state in its dirty and illegal war of intimidation against refugees. Unfortunately this is not an exceptional incident but an example of the disgusting tactics deployed every day to enforce the border in Calais.